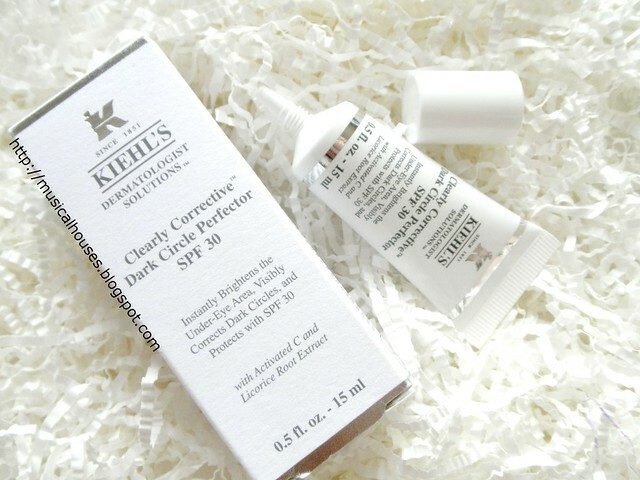 Kiehl's recently launched their Clearly Corrective Dark Circle Perfector SPF30, and it's billed as a multi-use product. The Kiehl's website says that it is both a "brightening eye cream" and a "primer for the upper eye lid", so a hybrid "both a makeup and skincare product" kind of product. So yes, this is a pretty exciting-sounding product, because now, you don't need to apply a separate eye cream and concealer, because it does it all, and has SPF to boot! I've even heard some people tell me that with its multi-tasking benefit, it's basically "like a BB cream for eyes". Eye cream, concealer, primer, sun protection - looks like the product does it all! 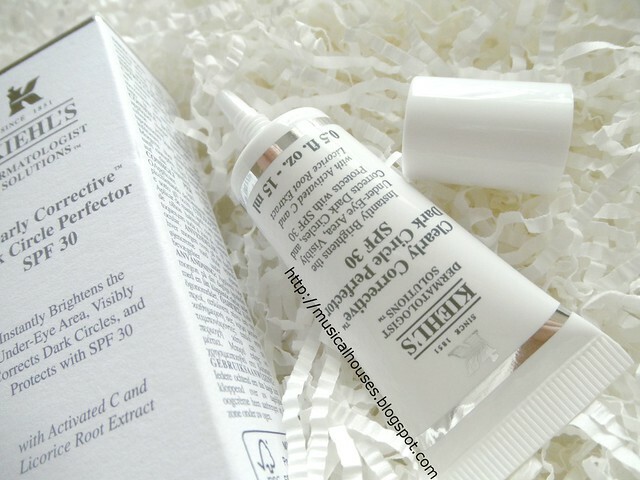 Kiehl's Clearly Corrective Dark Circle Perfector SPF30: A multi-tasking eye cream, concealer, primer, and sunscreen for eyes! Now, of course you guys know how I feel about the hype BB creams get - and I've also actually reviewed Kiehl's BB cream as well. So I thought it would be great to, as is my fashion, start by deconstructing the hype around the product, to analyse the product and see whether it really does confer both skincare as well as makeup benefits. 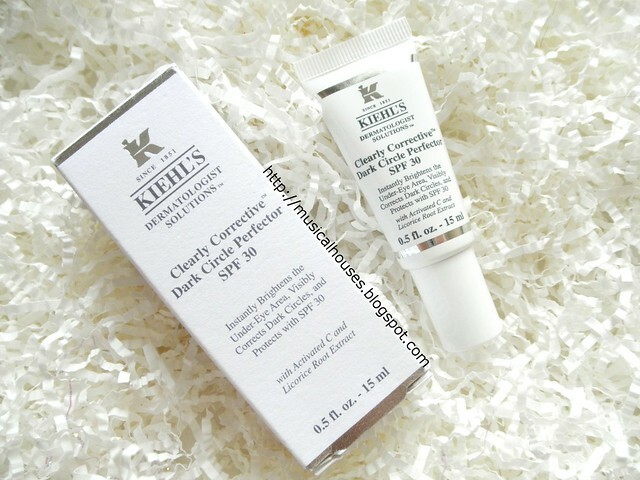 Kiehl's Clearly Corrective Dark Circle Perfector SPF30: Billed as a "BB cream for eyes", this promises to help you skip a few steps in your routine. And, because you know how much of a skincare nerd I am, you'll know that this analysis begins at nowhere else other than the ingredients list! Don't worry, I promise it gets much more interesting after that, with swatches and a full review! First, let's take a look at the ingredients list. The Kiehl's Clearly Corrective Dark Circle Perfector SPF30 is part of Kiehl's Clearly Corrective skincare range, which consists of products meant to whiten and brighten the skin - a very popular given that fair, clear skin is always in vogue in Asia. I've also actually reviewed the Kiehl's Clearly Corrective White Hydrating and Clarifying Treatment Masque, which is another product under the Clearly Corrective line. As you might expect, with both products being in the same line, there are some common ingredients across both products. The Kiehl's Clearly Corrective Dark Circle Perfector SPF30 has as its main ingredients water, emollients (Isododecane), humectants (Glycerin), some silicones and polymers (Cyclopentasiloxane, Dimethicone, Cyclohexasiloxane, Nylon-12, Dimethicone Crosspolymer, PEG-9 Polydimethylsiloxyethyl Dimethicone, PEG-10 Dimethicone) which fulfill various objectives - some of the silicones (Cyclopentasiloxane, Cyclohexasiloxane) actually evaporate quite quickly once applied onto the skin after helping to disperse the product, thus providing the product with a lightweight feel and a fairly quick "drydown", some others (Dimethicone, PEG-10 Dimethicone, PEG-9 Polydimethylsiloxyethyl Dimethicone) serve as emollients, which help to condition the skin and provide a barrier from further water loss, and still others (Nylon-12) serve as thickening agents to enhance the feel and the texture of the product on the skin. There's also Disteardimonium Hectorite, which is a rheology modifier. These are fairly standard ingredients, that are commonly found in both eye creams, as well as eye primers. 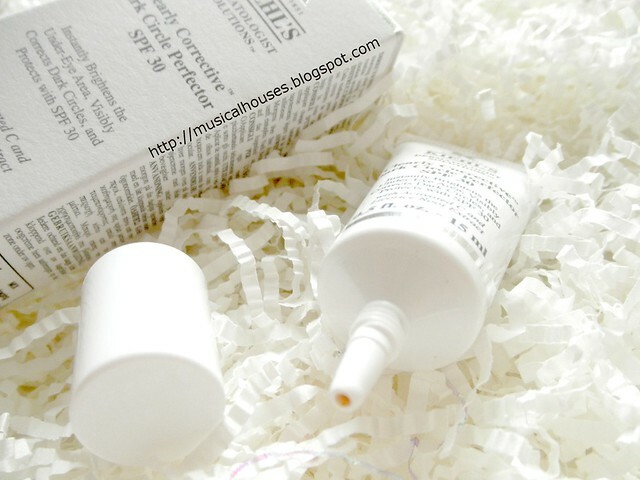 Of interest to us in particular is 3-O Ethyl Ascorbic Acid, which is also found in some other products in the Kiehl's Clearly Corrective line, like the Kiehl's Clearly Corrective White Hydrating and Clarifying Treatment Masque I reviewed previously. I talked a little about 3-O Ethyl Ascorbic Acid in that post, but basically, it is a fairly novel form of Vitamin C. Vitamin C (in the form of Ascorbic Acid) is notoriously unstable, and has to be kept away from light and air, making it difficult to package, so the benefit of using 3-O Ethyl Ascorbic Acid is that it is much more stable in skincare product, thus giving the product a longer life. This is the ingredient that gives the Kiehl's Clearly Corrective Dark Circle Perfector SPF30 its main skincare benefit against dark eye circles, since it has anti-oxidant effects helps to brighten the eye area. In addition, there are also some minor (meaning present in fairly small amounts of likely less than 1%) ingredients, including Caffeine, which is often found in eye products to help de-puff eyes, and Licorice Root Extract, a plant extract that is often found in brightening products, and also could have anti-inflammatory benefits. There are also other functional ingredients like preservatives (Phenoxyethanol, Ethylhexylglycerin, Chlorphenesin), opacifying agents (Aluminum Hydroxide), pigments to give the product its tint and colour (CI77891, CI77499, CI77492) and the like. So looking at the ingredients list, I guess in short, what we can expect would be a good (or at least fairly decent) undereye concealer that could act as a primer, with some anti-oxidant and brightening benefits, and a lightweight feel on the skin. And indeed, that was exactly how I found the Kiehl's Clearly Corrective Dark Circle Perfector SPF30 to be. It worked best for me as an undereye concealer with also some skincare benefits, and indeed it did have a lightweight feel on the skin. It comes in a very nifty squeeze tube with a small nozzle tip, which I found helps to not over-dispense the product (especially since 15ml isn't a large tube, so every drop counts! ), and to generally keep the product more hygienic than, say, a tub or a jar. Tube packaging (along with pump packaging) is my favourite type of packaging, so I definitely liked that Kiehl's went with the sensible, no-fuss option here. 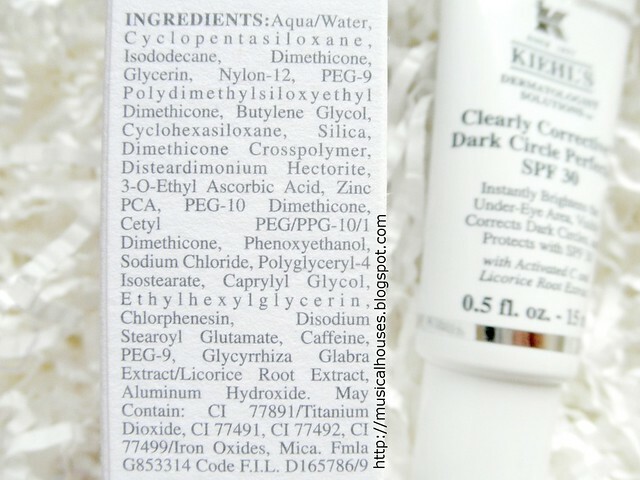 Above, you can see the swatches of the Kiehl's Clearly Corrective Dark Circle Perfector SPF30. It basically has a beige-toned tint to it, and as you can see, it does cover surprisingly well. I was expecting this to be a lot more sheer (perhaps I was expecting it to be a lightweight eye cream with a bit of a tint), but I think for those who need light to medium coverage on their undereye area, this might actually be all you need concealer-wise! The texture is fairly "runny", which is why the nozzle tip is a good idea (if not I would probably have wasted half the tube by accidentally squirting the product on myself by now). My bare eye - look at my undereye circles! Yay panda eyes! And, with the Kiehl's Clearly Corrective Dark Circle Perfector applied on my undereye area. You can see the difference - while it doesn't totally cover 100% of my dark circles, I would say it does a very good job of evening out and brightening the skintone under my eyes. And for an eye cream/primer/sunscreen hybrid, I would say the pigmentation is surprisingly good, too. This probably covers around 70% of my eyebags, which is good enough for me for everyday wear. But if you have more severe eyebags, or want more coverage, you could probably layer this under or over another concealer if you wish. 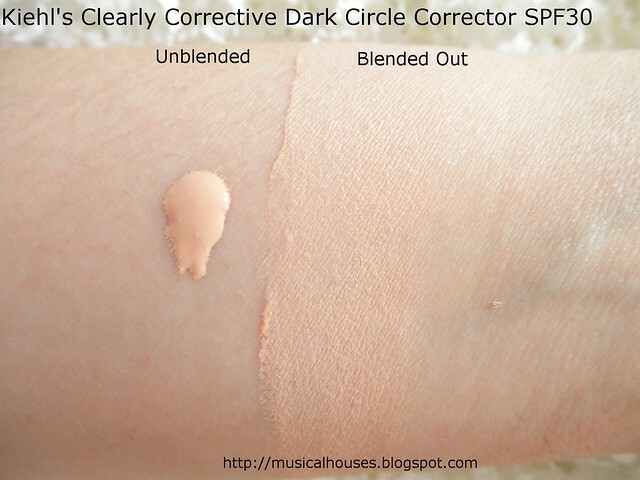 So, as a concealer, this worked great for me, and I loved the coverage and the fact that the beige tone actually blended well into my undereye skin (my skin is NC20, but my undereyes are, as you can guess, much darker). As a sunscreen it also works pretty well - SPF30 isn't anything to sniff at, considering that most eye creams don't actually have any SPF. As an eye cream, I found that it was a little light for my tastes because of its fairly light "runny" texture, but then again, thi would depend on your own personal preferences for eye cream. I guess I'm just used to thicker eye creams that come out of a tub, so while I didn't find this drying or anything, it probably wasn't as emollient as I was previously used to. 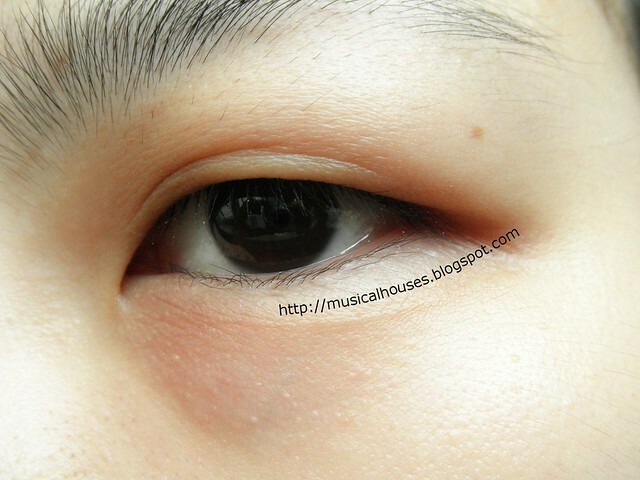 But someone who likes lighter eye products may well like this. And as a primer - well, this is where the product was probably the weakest for me. I mean, it's fine if you want to use it by itself, but it's really formulated more as an eye cream/eye concealer with SPF, so if you have high expectations and expect it to live up to an actual eye primer (like Urban Decay's Primer Potion and the like), then this will probably disappoint. I wouldn't use it as a primer (and anyway there are cheaper primers for the price! ), because it would seem like a waste of the product. I'd just use this as an eye cream/concealer, and use a separate eye primer. So, would I recommend this product? I would say definitely yes if you are looking for an undereye concealer with added skincare benefits and some SPF, because in my opinion, this is probably what the product is formulated to be strongest at. And if you are looking for a lightweight eye cream with a more thin texture and feel, then this is also pretty decent - and it comes with a fairly good amount of SPF and tint to boot. On the other hand, if you're thinking of getting this to use as an eye primer, then I would probably advise you to just get a separate eye primer instead. So in short, I would probably recommend this for its concealing and skincare benefits (including SPF), but not so much as a primer. But I guess this product is indeed, as promised, a multi-tasker that can help to save you some steps in your eye routine. The Bottom Line: The product is a hybrid between an undereye concealer, eye cream, and SPF, and works very well as a concealer with added brightening, anti-oxidant and sun protection benefits. I think the eye bags thing is like the shape of your eyes when you smile, not necessarily the sag under your eyes when you don't sleep enough. Like I have those bags but never noticed - or never thought there was a term for it- until it became trendy. It's just the shape of my eye! I like the way my husband's eyes crinkle at the sides when he smiles. But I wouldn't say "I like his crow's feet wrinkles", you know? Anyways I was already interested in this review, and my cousin started working at kiehls so I'll have to ask her about this. I really dig the spf, but I'm worried the color will be too light for my skin tone. So many bb creams I've tried make me look so chalky and pale. I don't know if they're too yellow? Not yellow enough? Either way I look less "dewy glow" and more "zombie in clown makeup". @whoFilets: If it helps, this is definitely darker than the typical BB cream shade. I'm NC20 in MAC, and I think this would probably be a close match for NC/NW25, so it is darker than a bunch of BB creams in shade. But yes, If you do need a very tanned shade it might look a tad odd. Many thanks for the clear review and for showing the ingredient list! Super helpful. I was wondering, though - where does the sun protection in this product come from? I didn't see any active sun protection ingredients, and it didn't seem to have been mentioned in the review either. @Nick: Thanks for the question! I love it when other people pay attention to the ingredients in a product too and can add to the discussion! I missed that out in my review because I didn't see any traditional sunscreen filters among the main ingredients either. But I did check in with Kiehl's on your question, and their Education Manager Janis said, “100% Mineral filters refers to physical sunscreen ingredient which is listed as Titanium Dioxide on the bottom of box.” So I hope that helps! Hello hello! Thank you for checking. Much appreciated! Unfortunately, the answer you got from Kiehl's isn't really convincing. The titanium dioxide is listed at the bottom of the list, and after the phrase "may contain". If it is really SPF30, the ingredients providing this rating wouldn't be a "may contain", would it? It might be nice as a primer/eyecream type of thing, but until there was a clearer explanation of the SPF rating, I'd be wary of the SPF claim for sure. Pity, cuz I was pretty excited about it - so few eye creams have SPF let alone a factor of 30. So does it really help overcome dark circles or jus a basic eye cream for moisturisation?? I'm trying this one too- do you know where the SPF comes from? I can't see any SPF ingredients on there. @Jen W: I checked in with Kiehl's on your question, and their Education Manager Janis said, “100% Mineral filters refers to physical sunscreen ingredient which is listed as Titanium Dioxide on the bottom of box.” So I hope that helps! That's great, I want to try this...I usually try some home remedies as because it's chemical free, though it take time and effort, it works so great. Many of us often searching for the best eye cream for dark circles and puffiness, that are cost effective too. I read lots of Review over online about Garnier Skin Renew Anti-Dark Circle Eye Roller what do you think is that really a effective solution for dark circle problem?? Do you have any personal experience?